This site is provided as a service for the members of International Society of Travel Medicine. International Society of Travel Medicine is not responsible for the opinions and information posted on this site by others. We disclaim all warranties with regard to information posted on this site, whether posted by International Society of Travel Medicine or any third party; this disclaimer includes all implied warranties of merchantability and fitness. In no event shall International Society of Travel Medicine be liable for any special, indirect, or consequential damages or any damages whatsoever resulting from loss of use, data, or profits, arising out of or in connection with the use or performance of any information posted on this site. Food allergies can be life threatening. Travelers and their companions must be prepared to recognize and manage anaphylaxis in a timely manner. • A PDF of an emergency care plan, with drawings and step-by-step instructions, is available here. Advise your patients to fill it out, take it with them and give a copy to their traveling companion(s). • Patients should be instructed to carry enough injectable epinephrine, antihistamines, and inhalers to manage several attacks. For remote travel you may want to add glucocorticoids to their kit. Provide a letter stating they need to carry auto-injectors on their person. Click here to view a sample auto-injector letter. • “Self-treatment” does not mean skip the Emergency Room (ER). After using an epinephrine auto-injector they should remain under medical care for at least 4 hours to monitor for late-phase allergic reactions. • Remind your patients how to contact emergency personnel at their destination: click here to access a list of emergency numbers by country. • Travel companions should practice using trainer auto-injectors prior to departure. • A comprehensive review is available by clicking here. • Administer the epinephrine auto-injector according to instructions. Administer into mid-outer thigh, through clothing and hold in place up to 10 seconds, depending upon brand. • Call for emergency responder to help and to transport person to emergency room. • Administer an oral H1 blocker such as diphenhydramine. Fast melt formulations are easy to use and travel well. • If the patient is wheezing, administer a B2 agonist inhaler such as albuterol. • Stay with the person watching for changes. If symptoms worsen give a second dose of epinephrine using a new auto-injector. Hello, and welcome to ISTM's Tech Corner! We live in a digital age, and both travel medicine providers and travellers are increasingly using digital platforms for information sharing and communication. Digital medicine is changing the way we deliver healthcare, and offers an unprecedented opportunity to improve the care of patients: better decisions can be made and knowledge gaps narrowed as providers and travellers take advantage of readily available information. We are your hosts, Sarah Kohl, MD (United States of America) and Sarah McGuinness, MBBS (Australia) and we look forward to navigating the world of digital technology with you. In this new blog, hosted on the ISTM website, we will share digital advances that can help us improve our clinical practice as travel medicine providers, and help keep our travellers safe and healthy. How can the ISTM community help? Digital medicine is expanding at an exponential rate. Despite our keen interest, even we (your hosts) are unable to keep up with all the advances in digital medicine, so we welcome your suggestions, ideas and input. Guest reviewers are welcome so if you have a great resource to share or would like to write a review please click to email us: Sarah Kohl & Sarah McGuinness. 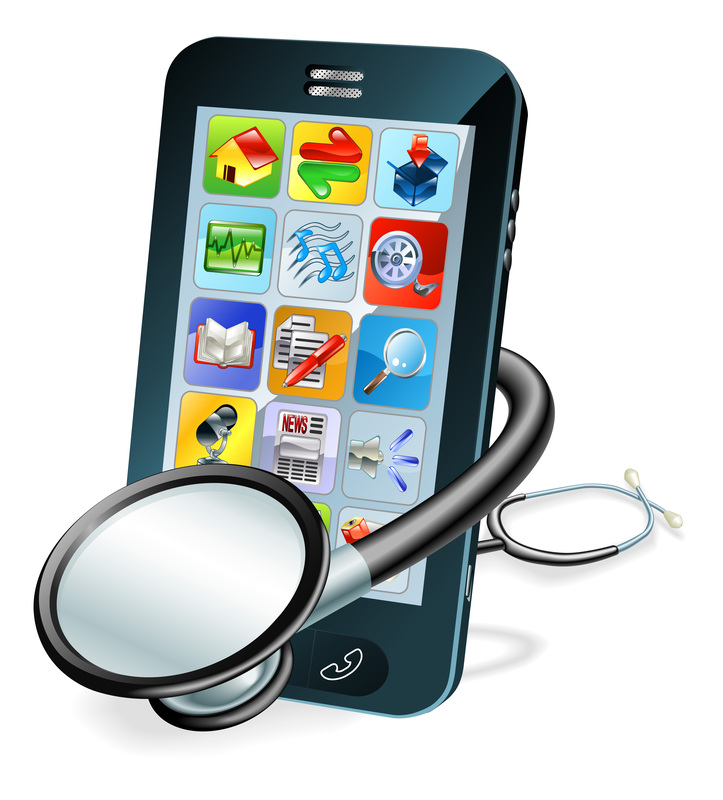 In our inaugural year we will review mobile apps (mHealth) relevant to travel medicine. Mobile apps are software applications designed to run on a mobile device such as a smartphone or tablet computer. Each month we will review apps that the travel practitioner can use or recommend to the traveller. In time, we will branch out into diagnostics, databases, therapeutics and other useful tech advances. The future is here, and we need to embrace it. At this time, neither Sarah Kohl nor Sarah McGuinness have conflicts to declare for any applications or products reviewed on the ISTM Tech Corner blog. If applicable, specific conflicts will be noted at the beginning of the blog post. Eating new foods while traveling is one of life's great pleasures...except when it makes you sick. While we can talk about food and drink choice with our travelers before they travel, we can't be with them when they are making food and drink choices during their trip. But wouldn't it be nice if we could provide them with food and drink advice they could carry with them in their pocket? In this edition Tech Corner we review a range of tech solutions that can help our travelers make safer food and drink choices while traveling. We have deliberately chosen apps that can be used anywhere in the world and provide medically appropriate advice. Each has been evaluated for the quality of information, ease of use, and engagement. FODMAP -- a Food Chemist in Your Pocket? For patients with irritable bowel syndrome (IBS), maintaining a low FODMAP diet can help to control gastrointestinal symptoms. However, selecting low FODMAP foods can be challenging and doing this while traveling is daunting. Long after your travelers have left the dietician's office they have to choose something to eat. Making low FODMAP food choices is difficult; simply choosing 'lactose-free' or 'gluten-free' does not eliminate all problematic foods. This is compounded by having to choose from unfamiliar foods when traveling. It's impossible to guess which foods are OK. For example, who would think that cantaloupe and honeydew melons are safe bets but watermelon can cause misery for affected individuals. This is where the low FODMAP diet app developed by Monash University, Australia comes in handy. Your travelers can simply pull out their phone and scroll through a list to discover if any of the four offending carbohydrate groups are present in the food they are considering. The app uses a red-yellow-green light system to identify foods with oligofructans, fructose, polyols, and lactose. Each person's sensitivity to FODMAP is variable so the app allows you to fine tune the recommendations using simple sliders for each of the four categories. You may also choose between English or German and select from 13 different countries for regional foods. For example, let's say you're in Arusha, Tanzania and you're wondering if you can eat a bowl of millet porridge. Simply open the app, search for millet and quickly discover green in all four categories. Yum, you can tuck into a delicious local treat. If, however, you think you might prefer rye toast, you can search for that instead (but when you find it highlighted in red you may decide to forego the croissant and the symptoms it might bring). Why will the travelers like this app? This app is easy to use and informative. It's easy to select food from the available options when traveling. It's like having a food chemist in your pocket. Simply swipe, choose your food and enjoy your meal, without worrying about repercussions. Communication is the key to avoiding food allergens. Many allergic travelers are concerned that the message about severe food allergy doesn’t make it to the people who actually prepare the food, and often severely limit their food choices to ensure they don’t have an accidental exposure. Translated food allergy cards provide a simple solution by describing allergies in the local language. The cards are easy to carry and can be handed to the kitchen staff by wait staff to ensure everyone is aware of the problem. Several online vendors offer allergy translation cards. Some allow you to print them yourself or store them electronically on your phone or tablet, while others mail them out. The cards are designed to be shown to restaurant staff so that they can prepare your food in a safe manner. Note that not all companies address the issue of cross-contamination by cooking utensils, which is a problem if you are extremely sensitive. It’s no fun to endure an ambulance ride to the local ER while your face swells up and you wheeze, especially when you don’t speak to local language. Why will Travellers Like These Cards? Food allergy cards help travellers communicate allergies to restaurants so that they can decide whether or not a particular food or beverage is safe to eat or drink. These cards are easy to use. They’re available in a wide assortment of languages to help travelers everywhere. The vendors listed below have personal experience with food allergies but none have medical training. Created by a merger of two leading patient advocacy organizations. This website has educational materials and a popular downloadable emergency care plan. Detailed tips for travel are available for 11 countries. Created by Allergy in Translation, the ‘Food Allergy Cards’ cards are available for 200 types of food allergies in up to 43 languages. Multiple allergens can be included on single card. User prints out cards for wallet. Created by Select Wisely, the ‘Food Allergy Cards’ cards are available for 10 types of food allergies in up to 55 languages. Can be emailed or shipped. Created by Dietary Card the ‘Food Allergy Cards’ cards are available for 100 types of food allergies in 17 languages. Shipped to your home. Making safe food and drink choices while travelling can mean the difference between having a great time, or spending the majority of your trip in the bathroom. As travel medicine practitioners we can (and do) educate travellers on safe food and drink choices before they depart, but often what we tell them goes in one ear and out the other. And of course, we cannot be by our travellers’ sides when they are making food and drink decisions on the run. But this is where ‘Can I Eat This?’ comes in handy. Created by the CDC, the app helps travellers decide whether or not a particular food or beverage is safe to eat or drink. The interface is pretty straightforward. Once you’ve selected the country you’re visiting and whether you’re eating or drinking, the app will ask you a few short questions about what it is, where you bought it, and how it is packaged or served. It will then tell you if the food or beverage is probably OK or probably not OK to eat or drink. Why will travellers like this app? This app is easy to use and informative. The cheeky commentary makes it fun for both kids and adults. Content can be accessed off-line, so travellers can check their food and drink choices on the go without needing an internet connection. The bottom line Can I Eat This? 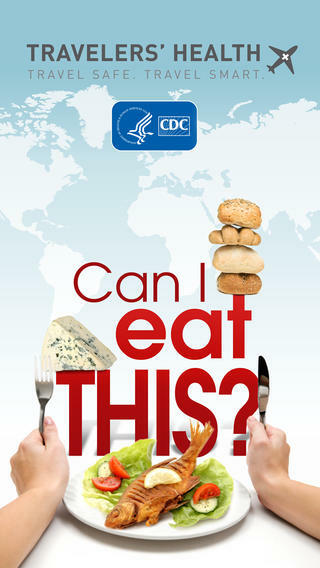 Created by the CDC, the app Can I Eat This? helps travellers decide whether or not a particular food or beverage is safe to eat or drink.